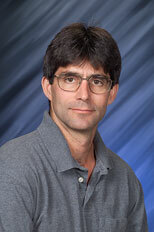 Dr. Greg Kimmel investigates thermal and non-thermal reactions at surfaces and interfaces. These reactions are important in a wide range of applications including catalysis, photocatalysis, radiation chemistry and waste processing. Since high-energy radiation typically produces numerous low-energy secondary electrons that are chemically active, the low-energy electrons (<100 eV) frequently play a dominant role in radiation chemistry. In addition, the presence of surfaces or interfaces modifies the reactions and processes compared to what occurs in the bulk. In photocatalysis, visible and/or UV photons are used to initiate a variety of reactions. However, a detailed understanding of the underlying physical and chemical processes is often lacking. Dr. Kimmel and his colleagues use surface science techniques to investigate thermal and non-thermal reactions at surfaces and interfaces. This work addresses several important issues, including the need to understand the relative importance of the primary excitation source compared to the secondary electrons it produces, energy transfer at surfaces and interfaces, and new reaction pathways at surfaces. Dr. Kimmel also investigates the structure of water films at interfaces. Understanding the structure of the water films provides a foundation for the development of a detailed understanding of the reactions at aqueous interfaces. energetic processes at surfaces and interfaces in fields such as radiation chemistry, waste processing, and advanced materials synthesis. Ph.D. Applied Physics, Cornell University, Thesis topic: Charge exchange processes for atoms and molecules scattering from metal surfaces. Akin M.C., N.G. Petrik, and G.A. Kimmel. 2009. "Electron-Stimulated Reactions and O-2 Production in Methanol-Covered Amorphous Solid Water Films." Journal of Chemical Physics 130, no. 10:Art. No. 104710. PNNL-SA-62554. Petrik N.G., and G.A. Kimmel. 2009. "Nonthermal Water Splitting on Rutile TiO2: Electron-Stimulated Production of H-2 and O-2 in Amorphous Solid Water Films on TiO2(110)." Journal of Physical Chemistry C 113, no. 11:4451-4460. PNNL-SA-60869. Lane C.D., N.G. Petrik, T.M. Orlando, and G.A. Kimmel. 2007. "Site-Dependent Electron-Stimulated Reactions in Water Films on TiO2(110)." Journal of Chemical Physics 127, no. 22:Art. No. 224706. PNNL-SA-56026. Petrik N.G., A.G. Kavetski, and G.A. Kimmel. 2006. "Electron-Stimulated Production of Molecular Oxygen in Amorphous Solid Water on Pt(111): Precursor Transport Through the Hydrogen Bonding Network." Journal of Chemical Physics 125, no. 12:124702 (11 p.). PNNL-SA-50526. Petrik N.G., A.G. Kavetski, and G.A. Kimmel. 2006. "Electron-Stimulated Production of Molecular Oxygen in Amorphous Solid Water." Journal of Physical Chemistry B 110, no. 6:2723-2731. PNNL-SA-46633. Lynch D.J., W.E. Wilson, M.T. Batdorf, M.B. Resat, G.A. Kimmel, and J.H. Miller. 2005. "Monte Carlo Simulation of the Spatial Distribution of Energy Deposition for an Electron Microbeam." Radiation Research 163, no. 4:468-472. PNNL-SA-44733. Petrik N.G., and G.A. Kimmel. 2005. "Electron-Stimulated Sputtering of Thin Amorphous Solid Water Films on Pt(111)." Journal of Chemical Physics 123, no. 5:054702 (1-7). PNNL-SA-42923. Petrik N.G., and G.A. Kimmel. 2005. "Low-Energy Electron-Stimulated Luminescence of Thin H20 and D20 Layers on Pt(111)." Journal of Physical Chemistry B 109, no. 33:15835-15841. PNNL-SA-43848. Sowa M.B., L.E. Kathmann, B.A. Holben, B.D. Thrall, and G.A. Kimmel. 2005. "Low-LET Microbeam Investigation of the Track-End Dependence of Electron-Induced Damage in Normal Human Diploid Fibroblasts." Radiation Research 164, no. 5:677-679. PNNL-SA-42273. Petrik N.G., and G.A. Kimmel. 2004. "Electron-Stimulated Production of Molecular Hydrogen at the Interfaces of Amorphous Solid Water Films on Pt(111)." Journal of Chemical Physics 121, no. 8:3736-3744. PNNL-SA-41294. Petrik N.G., and G.A. Kimmel. 2004. "Electron-Stimulated Reactions in Thin D2O Films on Pt(111) Mediated by Electron Trapping." Journal of Chemical Physics 121, no. 8:3727-3735. PNNL-SA-41765. Petrik N.G., and G.A. Kimmel. 2003. ""Electron-Simulated Reactions at the Interfaces of Amorphous Solid Water Films Driven by Long-Range Energy Transfer from the Bulk"." Physical Review Letters 90, no. 16:166102. PNNL-SA-37444. Orlando T.M., G.A. Kimmel, and W.C. Simpson. 1999. "Quantum-Resolved Electron Stimulated Interface Reactions: D2 Formation from D2O Films." Nuclear Instruments and Methods in Physics Research. Section B, Beam Interactions with Materials and Atoms 157. PNNL-SA-31500.